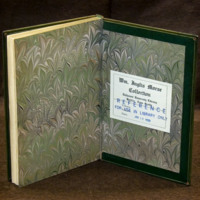 Morse, William Inglis. The Land of the New Adventure: The Georgian Era in Nova Scotia. Limited edition: No. 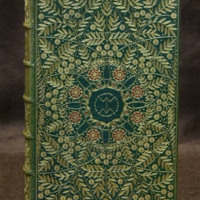 5 of 25 specially bound copies. London: Bernard Quaritch Ltd., 1932. (1 in pocket on back inside cover), plans; 22 cm. 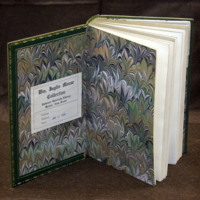 Edition limited to 375 copies printed on handmade paper with 350 numbered 1 to 350. 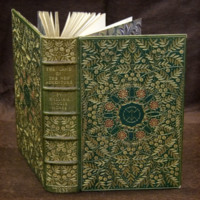 The remaining 25 were specially bound in full leather fine bindings by Douglas Cockerell and Son and numbered I to XXV. 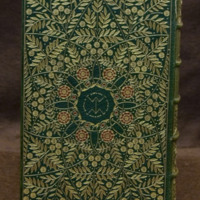 Volume bound in full green morocco leather; elaborate full cover decoration with red inlays and gold tooling framed by single gold fillet; front and back cover design a series of eight intersecting heart shapes outlined in gold; hearts and corner sections filled with a pattern of leaves, flowers and dots in gild; eight rosettes composed of gold background and red inlays at top of hearts form a circle in the centre of the cover; each rosette topped with a red dot inlay ; centre panels of both front and back covers has the monogram “WIM” ; monogram encircled with alternating dots and dashes in gild; green silk headbands; five raised bands on spine form six compartments with single gold fillet on spine edges, second and third compartments contain the book title and the author in gold upper case letters respectively; the first, fourth and fifth compartments filled with leafy floral pattern used on covers; sixth compartment contains leafy floral pattern and at the tail the place and date of publication in gold upper case letters; leather turn-ins decorated with inner single gold fillet and a single line of an alternating dot and a leaf along the outside edge; single gold fillet on all board edges and ten gold dots at head and tail of spine edge; fore edge gilded; front and back endpapers of the distinctive Cockerell marbled paper in gold, green, white and black inks. 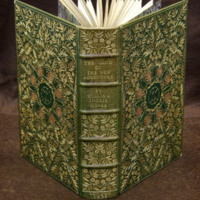 The visually appealing design and colour palate of the cover continue on into the book as the decorated green leather turn-in carries forward design elements from the front cover. 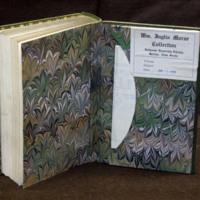 The shades of green and gold in the specific Cockerell marbled paper selected for the volume’s endpapers contrast in a pleasing manner with the shades of green and gold in the turn- ins. “D.C. & SON, 1932” is blind stamped into the lower right corner of the front inside cover turn in. 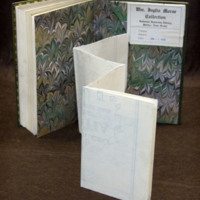 To house a large folding map, a pocket of marbled paper covered board was attached to the back inside cover. 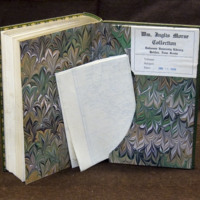 To accommodate the added thickness of the sturdy pocket an extra signature of blank pages was sewn into the back. 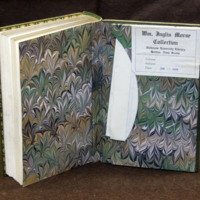 The extra signature was then trimmed down to a centimeter stub and covered with the marbled paper. When the back cover is closed, the pocket structure fits snugly into the space created by the removed back signature.